In the past, I have shared with you how multiple timeframes analysis substantially increases your trading profits (check out this post for a simple overview). But since the Morpheus system focuses on short to intermediate-term swing trading, my blog posts have always concentrated on daily, weekly, and monthly chart timeframes…until now. This time, I share with you my favorite methodology for using moving averages on intraday timeframes, rather than the much longer periods typically discussed on this blog. Spend a few minutes reading this blog post, apply the simple technique, and your stock picking win rate is bound to improve. Although I have been using this trading technique in the Wagner Daily newsletter for more than 10 years, this excellent strategy for fine tuning your intraday entry and exit points has rarely been explained. It’s not that using moving averages on intraday charts is some kind of big secret; the concept itself is pretty basic. Still, I typically avoid discussion of intraday trading techniques to avoid confusion about the Morpheus trading strategy, since the average holding period of our stock and ETF trades is several weeks to months. 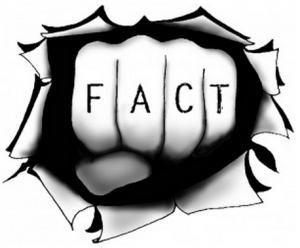 We have not suddenly ditched swing and core trading in favor of daytrading. This strategy is merely designed to supplement your existing trading system by increasing your odds of buying at the right time. When determining which stocks to buy (in bull markets) or sell short (in bear markets), we typically scan for trade setups and look for ideal entry points on the weekly and daily chart intervals. Assuming the weekly and daily charts look good, and all the key moving averages are in order, the next step (usually) is to wait for any current, multi-week price consolidation to run its course, which is typically necessary before a stock can move higher in earnest. 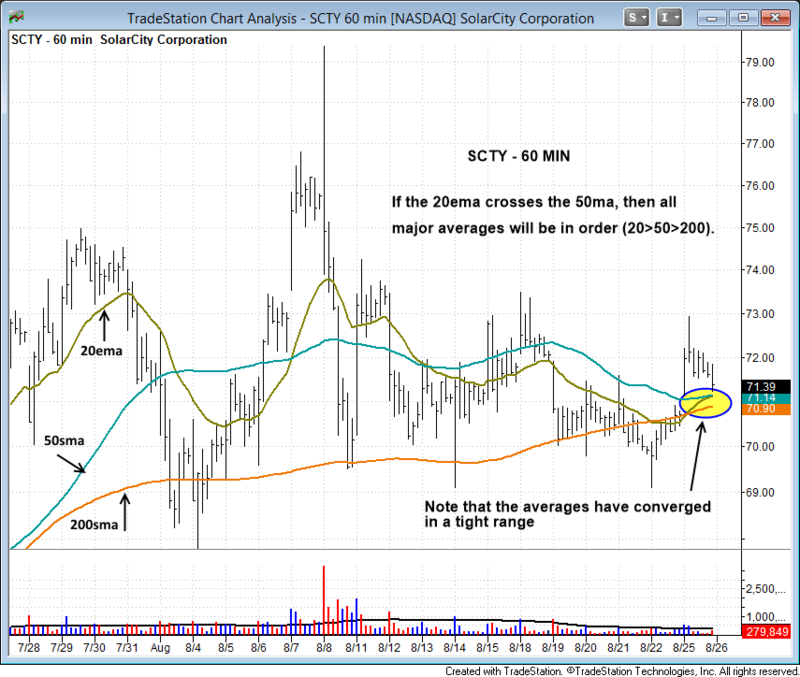 For example, the current daily chart of SolarCity ($SCTY) below shows all moving averages in the proper order to confirm an uptrend. With the price action tightening up around the 20-day EMA (beige line) lately, $SCTY may soon be ready to push higher (especially if support holds at $70). Conversely, a breakdown below the 20-day EMA would suggest the chart may need a few more weeks of consolidation before it is ready to move higher. Now that we know the daily chart pattern is solid (meaning a dominant uptrend is already in place), we next zoom in for a closer look at the intraday charts (60, 15, and 5 minute intervals) to get an idea of where the price action is, in relation to these moving averages. When dealing with a tight-ranged consolidation, it is important for the price of the stock to be above the 200-period MA on the 60-minute chart (this does not apply if seeking a pullback entry to the 50-day MA on a daily chart). Price should be above, or ready to break above, the 20-period EMA, which should also be rising (or at least have flattened out). 20-period EMA should be above, or ready to cross above, both the 50 and 200-period moving averages. On August 25, $SCTY gave the “all clear” signal on the hourly chart, around the $71.15 area, because the price was trading above all three moving averages. As with the 200-period MA on the hourly chart, we also look for the price to be above the 200-period MA on the 15-minute chart. All moving averages should be in the proper order (shorter periods above the higher periods), or at least close to crossing over and trending in the same direction. 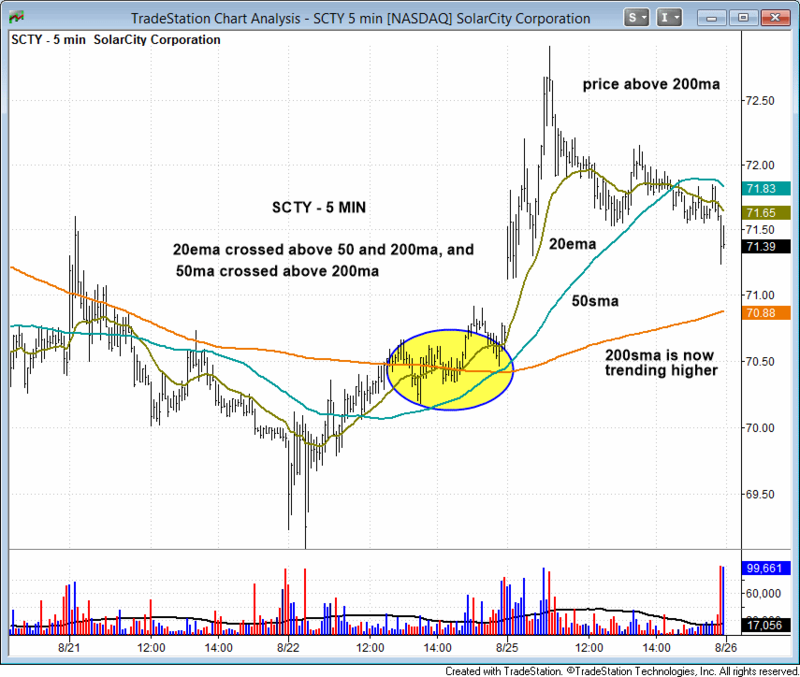 Again, $SCTY gave the “all clear” signal on the 15 minute chart, when it began trading above all three moving averages. Do you see the similarities to the hourly chart on the 15-minute chart below? Once again, we want to see the price trading above the 200-period MA on the 5-minute chart, and for the average to be trending higher or at least have flattened out. It is usually a bullish sign when the price action moves above a tight range on the 5-minute chart, especially when all the moving averages are clustered together (as they were late in the afternoon on August 22). 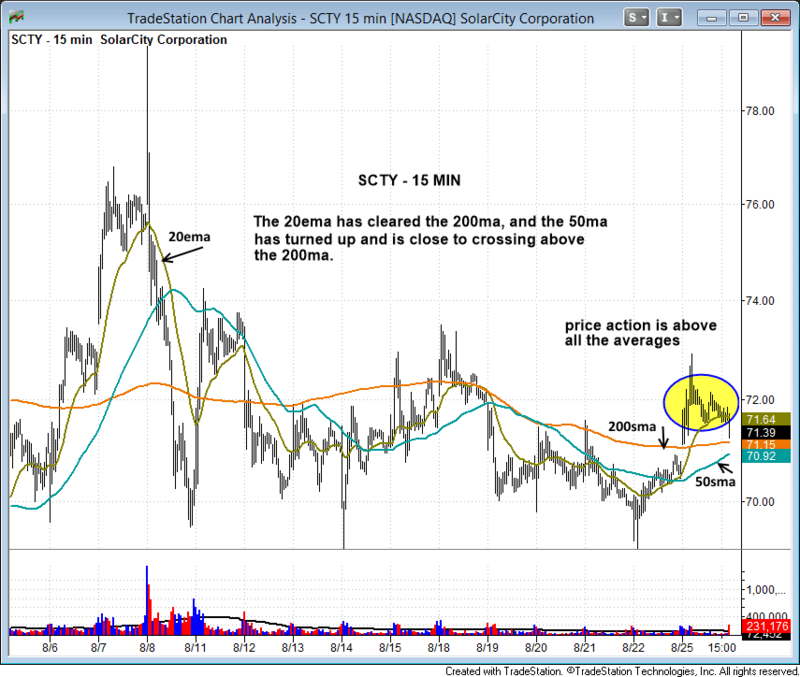 On August 22, around the $70.50 level, $SCTY shouted the “all clear” signal on the 5-minute chart, as the price began trading above all three moving averages (50-period MA was just below the 200-period MA, but still trending higher). If you were to analyze any one of the above charts by itself, without any other context, it would be difficult to spot this ideal buy setup. However, upon basic analysis of the 5, 15, and 60-minute charts, it is easily seen that the price was above all the major averages by the $71.15 level. On the daily chart, the move above $71 also put the price above all major moving averages (10-day MA, 20-day EMA, 50-day MA, and 200-day MA) as well. Although the weekly chart was not shown, the price was also above the 10-week MA ($70 area) and 40-week MA ($63.95). 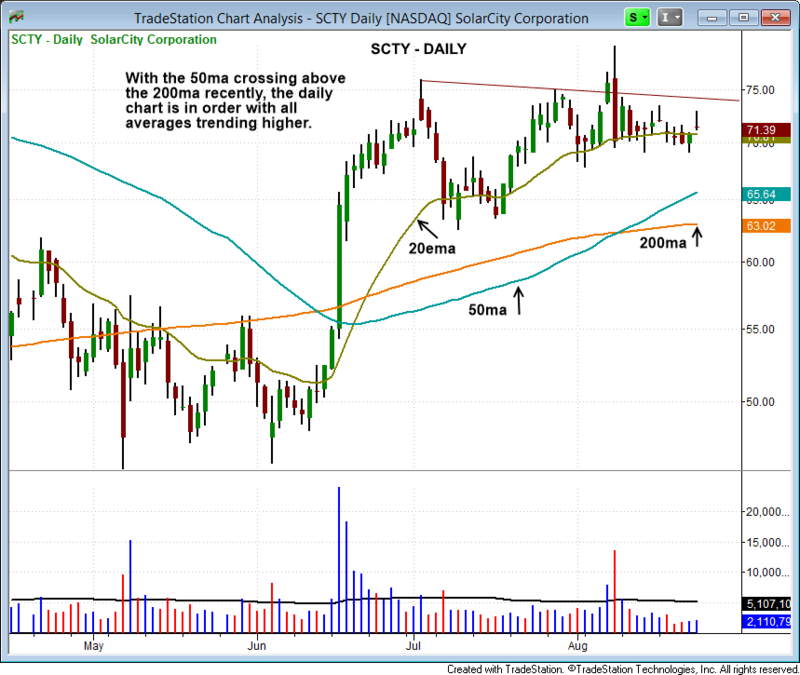 With the price now trading above all important moving averages on the weekly, daily, and intraday charts, $SCTY now has a pretty good shot at zooming higher after a few weeks of consolidation (sometimes sooner). By patiently waiting for the three main moving averages to line up on multiple time frames, you will always be placing the wind at your back and increasing the odds of a profitable outcome when entering new stock and ETF trades. Obviously, there is more to successful trade entries than just price and moving averages. Reliable technical indicators such as volume, price movement of a stock’s industry group, and the overall stock market itself are other crucial factors that must be assessed. But when all of these elements are in sync with one another, you are definitely looking at the potential for a superb winning trade! The theory and probabilities are all nice and good, but it’s also fair to note that after entering at around $72 in mid-August, a subsequent drop forced the trade to exit with a 6.5% loss. It would be prudent and fair to your readers to also disclose the stop limit and percentage loss the trade could face before exiting, and the general statistics of how successful that sort of swing trading is. Regardless, your approach probability-wise does work when one is persistent, disciplined, and equipped with the right technique.